It surely was an unbeetable experience this year! 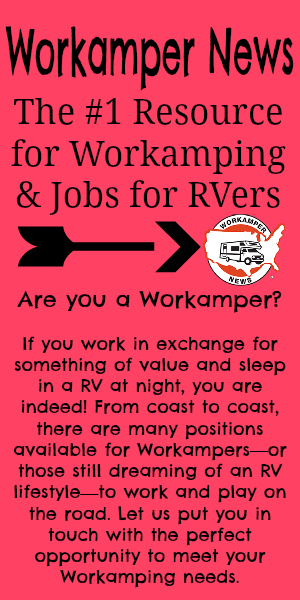 Tracy and Johnny are Workampers who are vlogging their Workamping experiences for others. They are new to YouTube and I’ve been following them since the summer. Johnny joined our Intro and Gold members Facebook groups and he’s been helping others in the groups with the Workamping lifestyle. Thank you, Johnny! They just finished up the Sugar Beet Harvest this past weekend. This was their first experience and it was definitely one to remember. Plan to arrive about a week before the harvest begins. Harvest starts October 1st and is scheduled to run 14 days, no matter how long it takes due to weather. It might take 28 days to work 14 – this year. The first week you will be filling out paperwork and training for a few days. They arrived at the Red River Recreational Park in Grand Forks, MN about a week prior to the start of the harvest. Your campsite is paid for and all hours worked are paid as well. Johnny was hired on at the piler and in the Day 2 video, he goes through his job duties and shows you exactly what he does and how the piling station works. Tracy was hired on in the lab section, but they are strict on videoing so no video on that part. She does go into detail throughout their series on what she does. It seems a bit complicated, but a most important part of the beet harvest. Bring clothes you don’t mind throwing away after the harvest – it’s muddy! Bring warm clothes – you will be outside 10-12 hours a day & don’t forget proper foot wear! Be prepared to bring your lunch & snacks daily. There is not enough time to leave for lunch. There is a page on their website full of FAQs. You can find it here. This season has been one for the record books. It took almost all of October to work the 14 days of harvest because of the weather, rain and snow. There were shut down days galore and keep in mind, no work means no pay. This is the first time in history they’ve had this many shut down days. Last year it took 14 days and it was done. This year it took about 28 days or so. Plan for the whole month of October and just prepare. During the harvest, Johnny and Tracy were having to call in daily to find out if they were working their assigned shifts. Johnny works days and Tracy works nights. This worked well for them since they have fur babies to care for. They are so cute! By harvest day 11, they were finally able to get some good work days in. Be sure to watch all the videos in their series. They are very informative and Johnny shows a lot of the yard so you can see just how dirty you can get. They both said the jobs they had were not strenuous, but you do have to stand on your feet hours at a time. If you can stand, you can do the job. What about pay? According to their website, they start out at $12 and it goes up from there depending on what job you have. Saturday and Sunday are considered prime days. You receive time and a half on Saturday and double time on Sunday, even if you don’t work during the week due to shut downs. The exception is if you call in sick – then it’s straight time. You also receive a bonus at the end of the harvest of around 5% of your total wages for your first year and it could go up the next year. Pretty sweet bonus! Johnny will post another video about how many hours they worked and how much they got paid. I asked them if they plan to go back, and he said, most definitely. Watch for the updated video once they receive their last paycheck. I would like to thank Johnny and Tracy of RV SWAT for sharing Workamper News in their videos and sharing how the website works for them. They have 3 offers for next summer already by utilizing the Resume Tool! They were able to get a job secured with Amazon Camperforce for November and December on their days off from the harvest. It works if you work it.